Fall always reminds me of my friend Peter Scholtes. It was during 2008 annual Deming Institute fall conference in Madison, Wisconsin when Peter said farewell to his friends and colleagues. He gave a keynote titled Deming 101 (that full speech can be watched online). Although inactive for many years and managing numerous health challenges, he was sharp, witty and very happy to be talking about Dr. Deming, systems thinking, problems with performance appraisal, talking to his old friends and reminiscing. Anticipating this event had really energized him. He told me numerous times he was very grateful for the opportunity. He passed away in July 11, 2009. Peter wrote two seminal books, both remain relevant years after their publication. The Team Handbook remains one of the best in developing teams and it has helped many organizations to improve quality and productivity through team building. The Leader’s Handbook is one of the best elaborations on Dr. Deming’s System of Profound Knowledge. giving vision, meaning, direction, and focus to the organization. No one has done a better job of operationalizing Dr. Deming’s teachings. This entry was posted in Deming, Psychology and tagged Deming, guest post, Joy in Work, Peter Scholtes on October 14, 2014 by Guest Post. The most popular books in July at Curious Cat Books were, Statistics for Experiments (1st edition), followed by Statistics for Experiments (2nd edition) and the Leader’s Handbook by Peter Scholtes. These books are great, I am happy others have been finding them and reading them. Statistics for Experimenters is co-authored by my father. The Leader’s Handbook is far away in the lead. The order of popularity on Amazon overall: 1) Out of the Crisis, 2) New Economics, 3) The Team Handbook, 4) Abolishing Performance Appraisals, 5) Statistics for Experimenters and 6) The Leader’s Handbook. The only thing that surprises me with the overall numbers is the Leader’s Handbook. The Amazon rankings are hugely biased by recent activity (it isn’t close to a ranking of sales this year). Still I expected the Leader’s Handbook would rank very well. It is the first book I recommend for almost any situation (the only exceptions are if there is a very specific need – for example Statistics for Experimenters for multi-factorial designed experiments or The Improvement Guide for working on the process of improvement. My guess is Curious Cat site users (and I am sure a fair number of people sent by search engines) are much more likely to buy those books I recommend over and over. Still many books I don’t promote are bought and some books I recommend consistently don’t rack up many sales through Curious Cat. I started this as a simple Google+ update but then found it interesting enough to expand to a full post. Hopefully others find it interesting also. This entry was posted in Books, Deming, Management and tagged Books, Deming, leadership, management, Peter Scholtes, Statistics, Statistics for Experimenters on August 3, 2011 by John Hunter. An Introduction to Deming’s Management Teaching and Philosophy by Peter Scholtes – webcast from the Annual W. Edwards Deming Institute conference in Madison, Wisconsin, November 9th, 2008. My previous post on this speech: 6 Leadership Competencies. Next month, the Annual Deming Institute conference will be held at Purdue on Oct 10th, 2009. This entry was posted in Creativity, curiouscat.com, Deming, Education, Innovation, Lean thinking, Management, Performance Appraisal, Popular, Process improvement, Psychology, quote, Respect, Science, Systems thinking, webcast and tagged curiouscat, Deming, Innovation, management, management webcast, Performance Appraisal, Peter Scholtes, Popular, quote, respect for people, Systems thinking, webcast on September 14, 2009 by John Hunter. 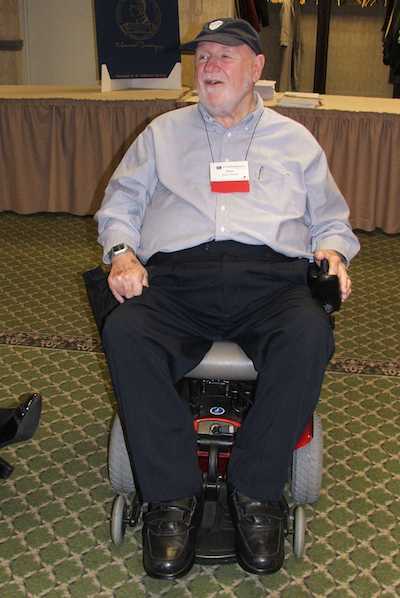 Peter Scholtes died peacefully this morning [11 July 2009] in Madison, Wisconsin. His family was with him. My father wrote about the First Street Garage project in W. Edwards Deming’s Out of the Crisis (pages 245-247). Peter (who was working for the City of Madison at the time) and he became good friends working on that project together. Peter went to work for Joiner Associates afterwards and was a primary author of the Team Handbook. And Peter spent many years working with Dr. W. Edwards Deming and moving forward Dr. Deming’s ideas. I would meet with Peter when consulted in Washington DC (which he did a good deal) and when I would visit Madison. He was extremely funny, compassionate, competent and effective. It was always a joy and educational to spend time with him. His Leader’s Handbook is the first management book I recommend to anyone. Peter enriched my life and the lives of many of others. And he will continue to do so through his works and those who were influenced by him. Peter was a great friend and a wonderful person to talk with. I valued our shared interest in improving people’s lives by improving the practice of management. Peter was a priest before moving into management improvement. He retained his focus on helping people lead rewarding lives as a consultant. And we shared the desire to make the huge amount of time people spend working a much more rewarding experience. Making progress in that vein requires not just a wish to do so but the ability to learn and effectively apply ideas to affect real improvement. He was exceptionally gifted at this difficult task and was aided here, as with most things he did, by his considerable empathy and respect for others. His books provide evidence of this gift and effort. And those who were lucky enough to hear him speak enjoyed his ability to use humor to great affect in the effort. In one of his last speeches, for example, when he speaking at the Deming conference (where the photo was taken) he used the action of kissing to underscore a point he was making about systems thinking and he described the challenges of gathering accurate data by recounting a radio interview he had heard about a research scientist who, in order to accurately assess the hibernation activities of bears, had to discretely sneak up on them during hibernation and well… take their temperatures in a non-genteel way. I am very lucky to have developed friendship’s with several of my father’s friends. The photo shows me with two during my last visit to Madison: Peter and George Box. Yes they’ll know we are Christians by our love. This entry was posted in Deming, Management, quote, Systems thinking and tagged Bill Hunter, Deming, John Hunter, Madison, management, Peter Scholtes on July 11, 2009 by John Hunter. The ability to think in terms of systems, and knowing how to lead systems. Understanding how we learn, develop and improve. Leading true learning and improvement. Understanding people and why they behave as they do. Understanding the interdependence and interaction between systems, variation, learning and human behavior. Knowing how each affects the other. Giving visions, meaning, direction and focus to the organization. As those familiar with Dr. Deming will immediately note those are very closely tied to Deming’s 4 areas of management. I am a friend (and manage Peter’s website so I am biased) but as I have said before anyone interested in management should read his book (the competencies are discussed in chapter 2). The photo shows George Box, John Hunter and Peter Scholtes (from left to right) at the MAQIN reception the night before the conference. Two previous mayors of Madison introduced Peter’s talk: Paul Soglin and Joe Sensenbrenner. This entry was posted in Deming, Management, Psychology, Systems thinking and tagged Deming, John Hunter, Madison, Peter Scholtes, quote, tips, variation on November 13, 2008 by John Hunter. According to one study by Watson Wyatt, the human resources consulting firm, only 3 in 10 employees believed that their companies’ performance review system actually improved performance. In another study by the firm, almost half of the employers surveyed thought that their managers were at best only slightly effective in helping underperforming employees to improve. Mary Jenkins, a co-author of Abolishing Performance Appraisals: Why They Backfire and What to Do Instead advocates a system in which employees themselves seek feedback from people they work with or who have skills they seek, then review a self-designed growth plan with their supervisor. She is using this approach at Genesys Health System in Michigan, where she is vice president for organizational learning and development. I would go with the elimination of performance appraisals, myself (see related links below for details). I strongly suggest chapter 9 (Performance Without Appraisal) of The Leader’s Handbook, by Peter Scholtes, for those thinking about this topic. This entry was posted in Management, Performance Appraisal and tagged Deming, Performance Appraisal, Peter Scholtes on October 6, 2008 by John Hunter. Pratt & Whitney Rocketdyne’s Enterprise Thinking Network Ongoing Discussion series this month features conference calls with Peter Scholtes (Thursday, September 25th, Noon to 2pm Pacific Time – USA) and Brian Joiner (Friday the 26th, Noon to 2pm Pacific Time – USA). See more details [the broken link was removed] and register online. Peter’s books (The Team Handbook and The Leader’s Handbook) are thought pieces for Thursday’s conversation with Peter. As a place to begin the conversation with Peter, we might consider the possibility that teamwork and leadership are perhaps even more in our awareness today than when Peter wrote these books. And if you’d like to explore more of Peter’s thinking and writing, see also a variety of articles and letters by and about Peter at his website. Both Brian and Peter are from Madison, Wisconsin (where I grew up) and both worked with my father: Bill Hunter. Brian Joiner also wrote Fourth Generation Management and co-authored the Team Handbook with Peter. This entry was posted in Books, Deming, Management and tagged Books, Brian Joiner, Deming, Madison, Peter Scholtes on September 23, 2008 by John Hunter. for his efforts to inspire others to transform organizations by helping managers understand how successful leadership of people requires an understanding of the interdependencies among knowledge about variation, psychology, appreciation for a system, and the theory of knowledge. The Deming Medal is presented to those who, like Dr. Deming, have successfully combined the application of statistical thinking and management so that each supports and enhances the other, thus leading to quality in products and services. I have known Peter since he worked with my father applying Deming’s ideas at the City of Madison. And since then I have had the pleasure to enjoy his company over the years in many arenas including at many Hunter Conferences, the Office of Secretary of Defense Quality Management Office, Deming Institute meetings and managing his web site. His Leader’s Handbook is a great, practical and easy to read management book. I recommend it highly. The Team Handbook is also excellent for working with teams. This entry was posted in Deming, Management and tagged awards, Deming, Peter Scholtes on May 7, 2007 by John Hunter. The greatest managerial cynicism is that workers are withholding a certain amount of effort that must be bribed from them by means of various incentives, rewards, contests, or merit pay programs. This entry was posted in Deming, Management, Psychology, Respect and tagged Management, organization as a system, Performance Appraisal, Peter Scholtes, respect for people on September 19, 2006 by John Hunter.